This Fort Lauderdale hotel is located in Victoria Park, 6 minutes' drive from the beach. The Fort Lauderdale-Hollywood International Airport is 5 miles away. All rooms have free Wi-Fi, as well as a microwave and a refrigerator. This Florida vacation rental property is located on 400 feet of beach front and offers a full kitchen in the guest suites. Key West International Airport is 2 miles away. The 1800 Atlantic Suites features an outdoor heated pool. Featuring a tranquil tropical atmosphere along the shores of the Atlantic Ocean, this beachfront hotel features spacious accommodations and is close to many popular area attractions and recreational activities. Featuring an unrivaled oceanfront location in Sunny Isles, Florida, this 5-star resort offers gourmet dining options, full-service spa treatments and spacious guestrooms, all furnished with private balconies and modern amenities. Experience a magical Orlando vacation by staying in a luxury apartment resort near Walt Disney World. Attractions such as shopping, restaurants as well as other famous parks are within a short drive. These beautifully furnished holiday homes and flats offer all the amenities and comforts you desire - within minutes of Disney, Universal Studios, and SeaWorld attractions. 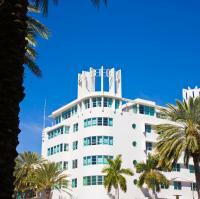 This hotel is within a 5-minute drive of Miami International Airport. The hotel offers free, 24-hour airport shuttle service, an outdoor swimming pool and an on-site restaurant. Conveniently located next to Miami International Airport, Airways Inn and Suites offers free 24-hour airport shuttles. This Florida hotel provides an on-site restaurant, outdoor pool and in-room safety deposit boxes. This Art Deco hotel is a 10-minute walk from the Miami Beach Convention Center and shopping on Ocean Drive and Lincoln Road. It features an outdoor pool with sun deck surrounded by coconut palm trees.